In this week’s Jewish Week newspaper, I wrote an article about the deluge in kosher restaurants in NYC focusing on high-end burgers. (Click here to read the article). The catalyst behind the article were my recent meals at Amsterdam Burger Co. (ABC), Le Marais, and Mr. Broadway, coupled with the news that Teaneck’s Gotham Burger is opening a new location on the Upper West Side, 5 blocks north of ABC on Amsterdam Ave.
I’ve recently tried ABC’s Breakfast burger (egg, hashed potato strips, fake bacon), Le Marais’s Jumbo burger (stuffed with beef cheeks), and multiple burgers at Mr. Broadway including their Hawaiian burger (pineapple & fried salami) and their BBQ burger (very similar to ABC’s Breakfast burger sans the fake bacon). 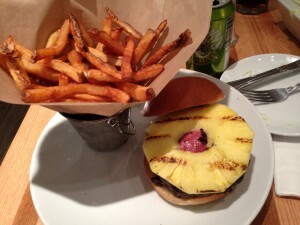 Of these, only ABC’s burger does not come with french fries, however, theirs was cooked the best. Breakfast Burger @ Amsterdam Burger Co. Most of these I found to be quite delicious. 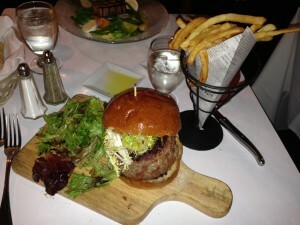 The one that I liked the least (and ironically was the most expensive) was the $21 Jumbo burger at Le Marais. It is served beautifully, but my main issue was the flavor. I LOVE the grill flavor on the burger. Because it is such a large piece of meat, the vast majority of the burger does not have the flame grilled taste that I love. The surface area of the burger doesn’t allow it it get close enough to the grill. People used to think I was crazy for loving the thin but flame grilled taste of Kosher Delight’s burgers, although those are neither high-end, or available anymore in Manhattan. Mr. Broadway’s burgers are consistently good (I have them often as I work nearby), and their fries are noticeably better since they revamped the restaurant late last year. 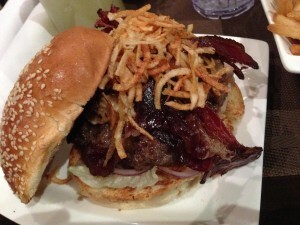 Not having tried Gotham’s burgers in Teaneck (sorry Jersey I can’t make the shlep out there often), I can’t comment on their burgers, although I hear really great things and look forward to trying them in NYC. This also leaves me wondering, what ever happened to Burgers Bar? I ate them all the time in Israel, and again in Brooklyn & Long Island when they launched here, but something must’ve gone awry for all of their NY branches to close within a few years. Hopefully, this new trend will not fade as quickly. Would love to hear your thoughts on this. Please comment below.